Six new helicopters purchased would be converted into temporary VVIP choppers to ferry the leaders across India. Modified versions of Mi-17 V5 helicopters will ferry Indian President Pranab Mukherjee and Prime Minister Narendra Modi around India, the Economic Times said on its website. India’s Defence Ministry approved the "conversion" of six new Mi-17 V5s into VVIP helicopters to replace the old Mi-8 helicopters with the Indian Air Force (IAF) elite Communication Squadron, according to the paper. The report added that IAF is progressively inducting 139 Mi-17 V5s, an upgraded version of the medium-lift Mi-17s, from Russia under deals worth over $2 billion. They are armed helicopters with more powerful engines to boost their payload carrying capacity at higher altitudes, according to the paper, which added that India needed VVIP helicopters in the near future. ET added that India’s security agencies wanted the VVIP helicopters to have “high tail booms” to allow cars to come right next to the rear exit staircase without “exposing” VVIPs to a threat from anyone in the vicinity, additional transit range, better crash-worthiness and armour protection. The Mi-17s are being used since the Indian government cancelling an order for 12 AgustaWestland AW101 choppers, over corruption allegations between Italian businessmen and their Indian intermediaries. One of the Indian intermediaries named in Italian court documents was recently arrested in Delhi. 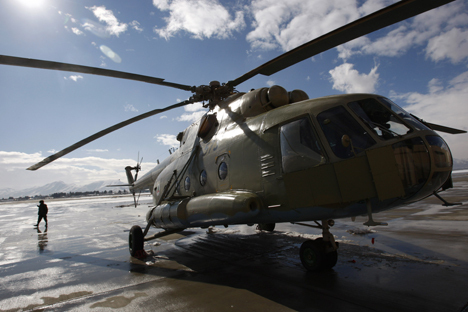 India ordered 80 Mi-17 V5 helicopters from Russia in 2008 for about $1.2 billion, which were expected to be delivered by the end of 2014. A follow-on clause was invoked to buy 59 more choppers for about $893 million. It is unclear when a new global tender would be issued for the VVIP choppers.